The mic preamp demo in the audio player below provides an sampling of how our mic pre shapes the tone with warmth and character. All of the tracks, except the Spanish guitar, were recorded with two Neumann KM-84 microphones going into the our Stereo Microphone Preamp. The Spanish guitar was recorded with the output of the guitar going directly into the instrument jack of the Edwards LE-10 Stereo Mic Preamp. 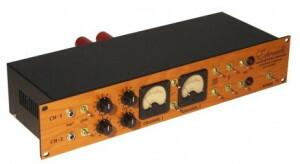 The LE-10 is a true warm tube preamp, very flattering to many instruments and vocals. There is no other way to describe it. Even when used with a very, very cheap mic it can make it sound like a good expensive one. For anyone who knows mics, to have a mic preamp that will do that kind of job is pretty extraordinary. Please visit our LE-10 Microphone Preamp Products page for more information and spec sheet. Also check out Testimonials from our loyal customers. What is a Mic Preamp and Why Do I Need One? In October 2013, Paul Vnuk Jr. of Recording Magazine published a favorable review of the LE-10 Microphone Pream!